Something in all of us wants to be connected to a place and the people who live in it. Those in our neighborhood and city are longing for it. I believe God is drawing his church back to ordinary, local relationships among real neighbors, whole persons in a real context, not just far-off mission conquests. People everywhere are discovering how the posture of “staying forth” instead of going forth can be exhilarating if we apply the same spirit of exploration to the place we find ourselves. What if we channeled all our enthusiasm for travel, exploration and service back into our own cities? Create a host space. A church remodeled their building around the idea of serving and hosting their local community. By being intentional they have hosted countless groups that engage and champion their community. Gather around what your community celebrates. A friend began to engage with the arts community and launched an art and faith discussion group in a local gallery. Each year a church hosts the “Redemptive Art Show” where they invite artists to come and show pieces with a redemptive theme. Get into the sports community. Two of my friends made the local YMCA their hub as coaches and active members. They became known there and invested in many people in their community. People have come to know Jesus through their influence there and they continue to coach teams whenever they can. Fill a community need. One church realized their town lacked a farmers’ market. Although none of their core team produced fruits and vegetables themselves, they became relational brokers and launched a farmers’ market every Saturday in the summer. Now the community gathers because a church dared to fill a community need. Join other rhythms. Some folks I know host gatherings for football (and other) games as a way to connect with people. Create regular relational traditions. Some folks have weekly traditions of lawn games, cookouts and kids’ playtimes at the park. 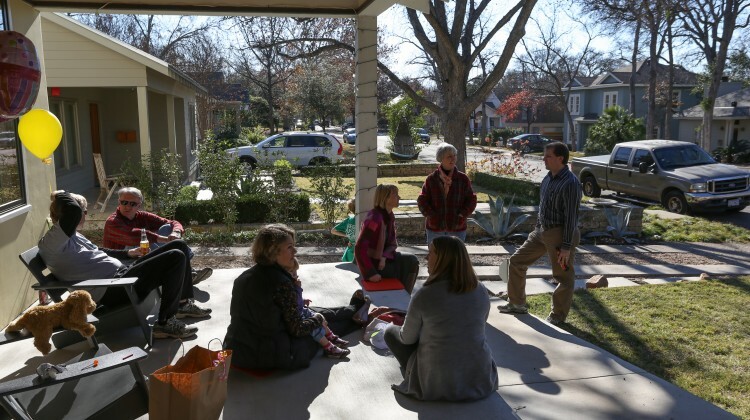 Others organize an annual neighborhood garage sale or make bake goods for neighbors. “Free Coffee Friday” has been another successful way to connect with neighbors and school parents. Cultivate front yard community. Move your grill to the front lawn, keep your lawn chairs handy, and shift your focus from your backyard to your front yard where you can interact with neighbors. Host a neighborhood night. Throw a block party, invite neighbors for dessert or host a game night. Whatever the activity, commit to hosting some activity or event on a regular basis. Our current places are becoming the next frontier and neighborhoods are becoming parishes again, where churches anchor their communities and every Christian can live out our first vocation as a follower of Jesus eyeball to eyeball.